Alaska cub arrives Wednesday; Montana yearling in next few weeks. Eatonville, Wash. – For the first time in its 43-year history, Northwest Trek Wildlife Park near Eatonville will be home to two grizzly bear cubs. 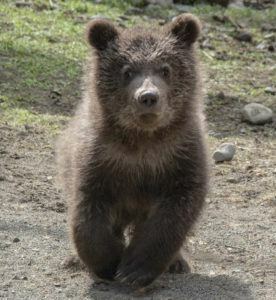 A cub estimated to be about 6-months-old is due to arrive at the wildlife park from Alaska on Wednesday; a yearling grizzly bear from Montana is expected to come to its new home in the next few weeks. They are males. When they’re ready, the bears will be introduced to the wildlife park’s 1-acre, forested habitat, which has been rebuilt to give them room to explore and protect them as they grow. 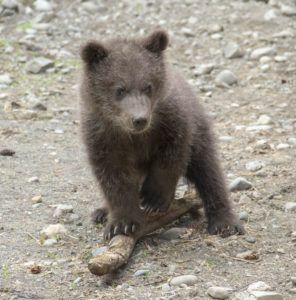 The Alaska grizzly cub coming to Northwest Trek. Photo John Gomes/Alaska Zoo. Both bears were orphaned in the wild and would not have survived without human intervention after their mothers were killed, according to wildlife officials in Alaska and Montana. Some of the funds for reconstruction of the wildlife park’s grizzly bear habitat were provided by Tacoma voters, who approved a $198 million Metro Parks bond issue in 2014. Northwest Trek is owned and operated by Metro Parks Tacoma. The Alaska cub was discovered emaciated and in need of care close to its mother’s body in an area near Nome. Although the death occurred during hunting season, it is illegal to kill sows with cubs, Alaska wildlife officials said. The cub was taken to Alaska Zoo in Anchorage, where his health was restored by a caring team of zoologists who fed him formula as many as five times a day and then helped him grow and thrive with a diet of apples, Rainier cherries, produce, fish and high-protein dog food, Curator Shannon Jensen said. He weighed only around 10 pounds – about half what he should have – when he arrived at Alaska Zoo in May. The cub now moves the weigh-scale meter all the way over to about 75 pounds. He’s about 2 feet tall from nose to tail. The Alaska grizzly cub plays with his favorite toy – a stick. Photo John Gomes/Alaska Zoo. The yearling grizzly from Montana was discovered in the northwestern portion of the state on the Blackfeet Indian Reservation between Browning and Valier. His mother was killed by a farmer after she attacked his pigs, according to the state’s Department of Fish, Wildlife & Parks. The young bear weighed about 75 pounds when he was taken to Montana Wild, which is operated by the Montana Department of Fish, Wildlife & Parks, in Helena. Keepers there have been caring for him since June 27. They estimate he was born sometime during the spring of 2017. The cubs would not have survived in the wild without their mothers to help them learn how to hunt and teach them the ways – and dangers – of the forest, Northwest Trek Zoological Curator Marc Heinzman said. As soon as the bears arrive, Northwest Trek keepers will begin to get to know them and set about providing them with the same kinds of foods – berries, plants, insects, and fish – that their mothers would have taught them to eat in the wild, bear keeper Angela Gibson said. They’ll get seasonal “dishes” such as strawberries, salmonberries and huckleberries in summer; fall will bring other foods for which a bear might forage in the wild, Gibson and other keepers will slowly introduce the two bears to each other with a see-through separation between their dens. Since they’ll meet and live together at such a young age, it’s expected they will become adopted “brothers,” perhaps with the older bear passing on some of the knowledge he learned from spending his first year with his mother. It likely will be several weeks before they’re ready to explore their newly “cub-proofed” habitat, which includes climb-resistant flashing installed on trees so their aspirations don’t exceed their ability to get up the tree – and back down. And rather than a pool that can hold a fully grown grizzly, a smaller, much-less-deep pool will allow them to cool off in water that’s a safe depth. Northwest Trek staff members will make alterations to the habitat to accommodate the bears as they grow. Before the cubs make their public debut, Northwest Trek keepers will supply a slate of suggested names. The public will be able to vote for their favorites. Adult male grizzly bears (Ursus arctos) can stand 3-to-4-feet-tall at the shoulders and grow to 6-to-11-feet tall. They will weigh into the hundreds of pounds. Although many remain in Alaska, Montana and other states, grizzly bears are endangered in Washington. Northwest Trek is working with other conservation partners to support a federal plan that would return some bears to remote areas of the North Cascades. Wildlife officials estimate that fewer than 10 grizzlies remain in an area of the North Cascades that spans nearly 10,000 square miles. They are known as an “umbrella species,” because the presence of grizzly bears can improve the health and balance of an entire ecosystem and the animals that live there. Northwest Trek’s keepers and other staff educators have been teaching guests about the bears’ importance for more than a quarter century. Northwest Trek’s first grizzly bears, Hudson and Denali, arrived in 1993 and lived well into their geriatric years. Both died in recent years. Northwest Trek Wildlife Park, accredited by the Association of Zoos & Aquariums, is a 725-acre zoological park dedicated to conservation, education and recreation by displaying, interpreting and researching native Northwest wildlife and their natural habitats. The wildlife park is a facility of Metro Parks Tacoma and is located 35 miles southeast of Tacoma off State Highway 161.